It is necessary that Christians be able to think properly. As we discuss our worldview with unbelievers and present arguments for God's existence and the resurrection of Jesus Christ it is necessary that we present sound arguments. It is also necessary that we be able to properly identify mistakes in arguments for other views so that the unsaved will see that their view is actually false and they need to change it. 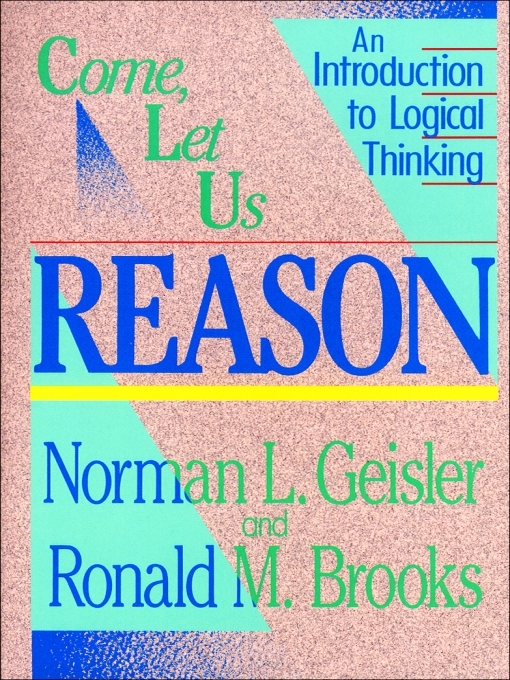 I read "Come Let Us Reason: An Introduction to Logical Thinking" many years ago, and it helped me greatly with being able to order my thoughts and identify incorrect thinking. This has helped me tremendously as I "tear down arguments against the knowledge of Christ" (2 Corinthians 10:5) and "provide a reason for the hope that I have" (1 Peter 3:15). I recently read the book again to refresh my memory and to write this review. As usual, the review will provide a chapter-by-chapter summary of the book's contents and conclude with my thoughts about the book. To a lot of people, the study of logic is intimidating; it is often seen as a difficult pursuit of arm-chair philosophers with little or no application in the real world. In the introductory chapter to this book, Geisler and Brooks dispel that myth. They begin by defining, simply, what logic is: ordered thinking. They explain that logic is merely the study of how to properly order our thoughts so that when we think, we come to correct conclusions. Everyday every person uses logic in every part of their lives. It is required even for mere communication between individuals. Thinking is important, so it is important to do it well. Knowing the basics about how to order our thoughts properly will help us to think more rationally and correctly. It allows us to be conscious of our mistakes in reasoning and to avoid false conclusions. This also gives us the ability to analyze the thought patterns and rationale of others. It allows us to help others order their thoughts properly to also avoid false conclusions. This book is specifically written to Christians, so Geisler and Brooks provide a biblical case for the study of logic and address some common reservations that Christians have about studying it. Geisler and Brooks begin by explaining the two kinds of logical arguments: deductive and inductive. Deductive argues from the general to the specific and provides necessary conclusions, while inductive argues from the specific to the general and provides probable conclusions. The type of argument they describe in this chapter is called the syllogism, which is a set of three propositions (two premises and a conclusion). Three different types of propositions do exist, but the focus here is on categorical propositions (the others come later). Categorical propositions are statements that take the form "this is that." Each of the terms has a specific name, a purpose, and relationship to the others. Each one can be quantified or qualified which affects the type of categorical statement the proposition is and how it functions in an argument. 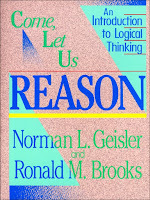 Geisler and Brooks do not just leave the reader with the concepts, though, they walk the reader through several examples (found in the Bible) and provides a series of exercises for the reader at the end of the chapter to help the reader become more comfortable with identifying the types of arguments, terms, and categorical propositions in real-world statements and arguments that people present. Giesler and Brooks explain that the syllogism is the format that propositions are put together in order to analyze the relationships among the propositions. They show how a syllogism is properly structured and how the terms within the three propositions of the syllogism connect to one another to establish a valid connection (the conclusion). They take the reader through seven basic rules that, when followed, will help create a valid syllogism. As in the previous chapter, they provide examples of each so that the reader can make the everyday connection. In many arguments, the propositions are not always clear, so the form is often changed (without changing the meaning) to help clarify and help identify proper connections. There are correct and incorrect ways to move terms around in a proposition to accomplish this. Geisler and Brooks go through all those also to help the reader avoid accidental mistakes that would undermine the validity of an argument. They conclude the chapter by identifying the seven possible relationships between the propositions of a syllogism. Throughout this chapter, they include charts and visuals to help the reader understand all the information, and they include three pages of various exercises for the reader to become familiar with applying the concepts. 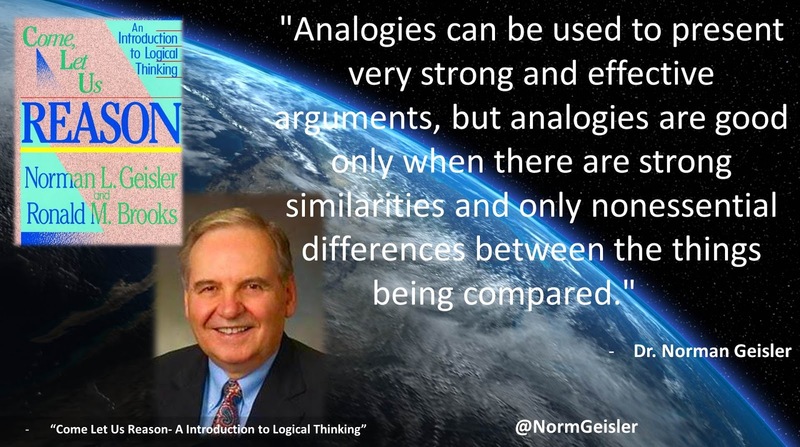 Syllogisms rarely appear in the form described in the last chapter in everyday life, but it is necessary to understand how they work to be able to identify them as we see them. Geisler and Brooks now takes the reader through the other ways that syllogisms will be presented. A very common form starts with an "if, then" then either affirms the "if" or denies the "then" to do the same to the other part of that premise. This can be done incorrectly by denying the "if" portion or affirming the "then" portion. Both of those lead to invalid conclusions. Many people also like to connect several claims together to make an argument, but each statement must connect to the next with the same term linking the subject of one to the predicate of the previous. This one must be done with care to ensure that links exist between each set of propositions, otherwise, the whole argument falls apart. Probably the most common alternative form comes as an argument that is missing one or several premises. A person simply states one or two premises, assumes that you know the others, then states the conclusion. This one must be used wisely and analyzed carefully. If we assume our audience knows a premise when they really do not, then we run the high risk that our argument simply will not make sense. We also must keep an eye out for these types of arguments because the assumed premises may actually be false, which would give a valid reason to reject the conclusion. As with the previous chapters, Giesler and Brooks provide many examples from the Bible and in theology; they also include a lengthy set of exercises to help the reader practice their ability to properly identify and analyze the alternative forms of syllogisms. 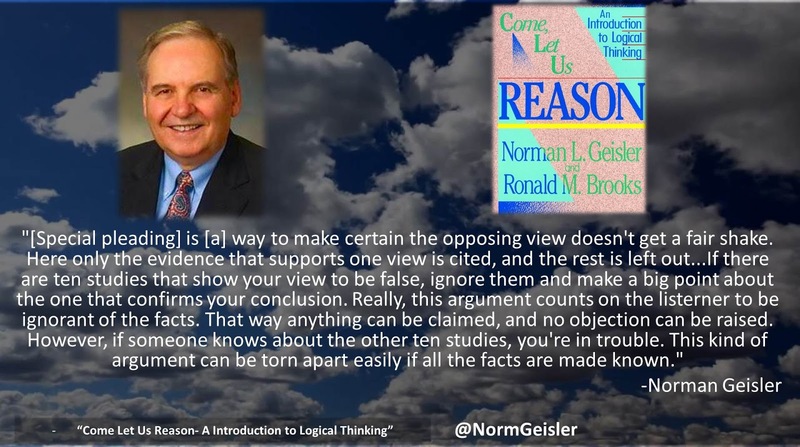 As Geisler and Brooks described the proper ways to form arguments in the previous chapters, they touched the most common ways to incorrectly form them. When an argument is malformed, it is called a formal fallacy. Unfortunately, formal fallacies are not always obvious because the argument is psychologically persuasive. But it is important to understand that persuasiveness and soundness are independent of one another, thus the soundness of an argument needs to be evaluated (so as to identify when a presented argument is misleading in its persuasiveness). The descriptions of the various formal fallacies were scattered throughout the previous chapters, so Geisler and Brooks put them all together in this chapter for a quick, concentrated reference and for exercises specifically targeted at identifying malformed arguments. Again, examples often heard in the Christian community and examples offered as challenges against Christianity are presented for immediate application for the Christian reader. 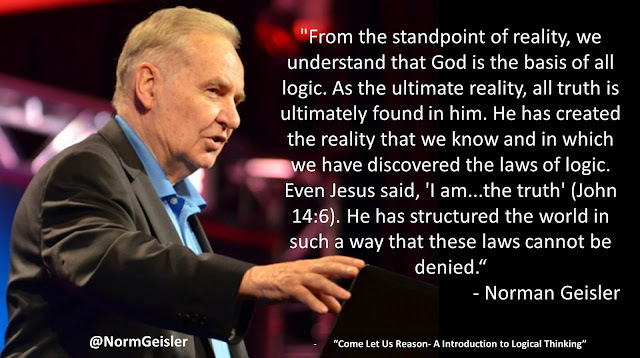 Of course, incorrectly formed arguments are not the only fallacies that can be committed in reasoning. An argument may have a valid form, but it may still commit a whole host of other fallacies that make the conclusion not follow. These other fallacies are called "informal" fallacies and are categorized into fallacies of ambiguity and fallacies of relevance. Fallacies of ambiguity persuade by presenting what is unclear as clear. Common examples of lack of clarity in arguments are definitions, relationships, circumstances, and emphasis. If the same word is used in an argument but its meaning is changed by any of these, a new term has been added to the argument and the conclusion logically does not follow. Fallacies of relevance persuade by avoiding the issue at hand; some are blatant, while others are more subtle. Geisler and Brooks spend the majority of the chapter going through these because so many ways to avoid the issue are commonly used in arguments. Some examples are appeals to character, popularity, majority, generalization, and false dilemma. 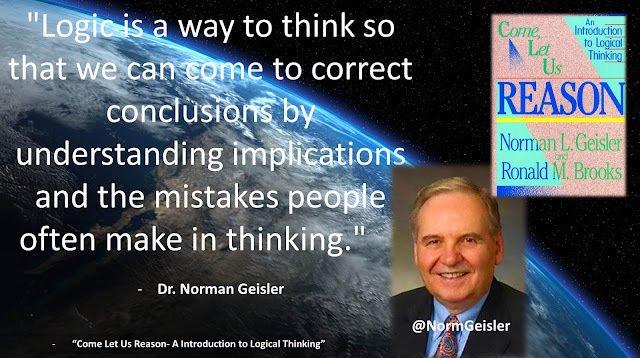 Geisler and Brooks explain how each of these (and many more) fails logically and provide examples that are commonly used. As with the previous chapters, exercises to help the reader process and apply the new information are provided. Now that the reader is armed with the knowledge of how to form a valid argument and identify fallacies, it is time to learn to apply this in real life. It is extremely rare that anyone writes in a strict, logical format, where logical analysis is straightforward. Writing and conversing are done in ways that make them appealing and engaging, which often requires the use of different language for the same concepts, the omission of the obvious, and addition of "color." It is important to learn to convert everyday conversation and writing into logical arguments to better evaluate their soundness. Geisler and Brooks take the reader through the steps to perform the conversion. They recommend beginning with identifying the conclusion. From there the subject and predicate are discovered which allows for the identification of each premise (which may be implied). The middle term can be clearly seen (or not, if there is none or multiple ones exist), and analysis for formal validity may begin. Once an argument has been determined to be formally valid, the argument then can be examined for informal fallacies. This, like everything else, does take practice, so exercises are included. Deductive arguments, though, are just one type of argument. Another type is inductive arguments. While deductive arguments render necessarily true or necessarily false conclusions, inductive arguments render probably true or probably false conclusions. Inductive arguments' conclusions range from virtually certain to virtually impossible but never reach actually certain or actually impossible. To clear up any confusion about certainty provided by the types of arguments, Geisler and Brooks explain the distinctions among mathematical certainty, inductive certainty, and moral certainty. This helps the reader to assign the proper level of certainty to their own inductive argument and understand the proper level of certainty of others' inductive arguments (regardless of what level of certainty the other person tries to ascribe to their argument). Since inductive arguments deal with probability, Geisler and Brooks describe the three kinds of probability. To show the reader the power of inductive arguments, they use probabilities to present arguments for the design of the universe by God and the inspiration of the Bible. One of the most common applications of inductive reasoning is scientific thinking. Geisler and Brooks take the reader through the eight-step scientific method and the four experimental methods for discovering how the world operates. They explain that these are limited to discovering present, repeatable events and is often called "observational" or "operational" science. However, when combined with the principles of causality, uniformity, comprehensiveness, and consistency, they can be used to discover repeated and singular events of the past ("historical" and "origin" science, respectively). To show the reader how these are put into practice, they use the methods to show that the universe has a beginning (and a Beginner), and they demonstrate that the Angel of God is the one who rolled away the stone from Jesus' tomb. (NOTE: For those who want a more in-depth look at the distinctions, methods, principles and their proper applications described in this chapter, Geisler coauthored a book with Kerby Anderson, "Origin Science: A Proposal For The Creation/Evolution Controversy," that provides a book-length treatment of the subject, and I highly recommend it). Geisler and Brooks bring the book to a close by discussing the fallacies in Scientific thinking The explain several common fallacies including the neglect of evidence against a particular conclusion, thinking that because an effect follows something that that something is necessarily the cause, and focusing on irrelevant factors. Since the goal in scientific thinking is to discover cause-and-effect relationships, many mistakes that can be made in reasoning are in related to identifying the cause, including confusing the cause with the effect, confusing a concomitant event with the cause or thinking that a condition is the cause. Six different kinds of causes can exist for every event, and some mistakes come from the confusion of these causes with one another. Examples of these fallacies are explained in how it is argued that the Bible is not truly the Word of God. As with all previous chapters, exercises are provided for practice. As I mentioned in the introduction, "Come Let Us Reason" has had a great impact on my ability to properly order and logically present a defense of the Christian faith. 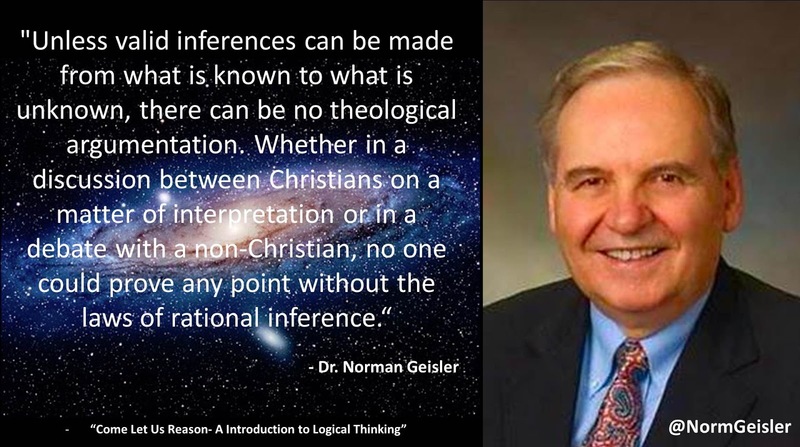 One of the things that initially attracted me to this Geisler's and Brooks' book was that as they describe the different concepts in logical thinking, they provide examples that Christians can immediately identify with. It makes the study of an otherwise dry subject more exciting when there is immediate application for familiar situations; it is especially exciting when the authors identify fallacies in arguments for conclusions that we know are false but we haven't been able to identify the problem with the reasoning. The book contains a lot of content but Geisler and Brooks present it in an organized fashion that helps the reader grasp it The exercises at the end of each chapter give the reader practice. As comprehension through the exercises is solidified, the content becomes less overwhelming and more exciting. Obviously, I recommend this book to all Christians, especially if you find yourself in discussions about worldview, theology, politics, or any other situation where you need to provide reasons for your views. If you consider yourself a Christian case-maker, apologist, or just like getting into discussions where people will differ with you, this book will be indispensable in getting you started with being able to present your view logically and identify logical problems in your and others' views. Legislating Morality: Is It Wise, Is It Legal, Is It Possible?